The US Food and Drug Administration has given the green light to US marketing of a noninvasive medical device developed by Jerusalem-based Brainsway Ltd. to treat obsessive-compulsive disorder. OCD is a common, chronic disorder in which the sufferer has uncontrollable, recurring thoughts and feels compelled to repeat certain behaviors over and over. It is typically treated with medication, psychotherapy or a combination of the two. According to the National Institute of Mental Health, about 1 percent of US adults had OCD in the past year. Although most patients respond to treatment, some continue to experience symptoms, the FDA said in a statement announcing its decision on August 17. “No serious adverse reactions related to the Brainsway device were reported,” said the FDA in its statement. 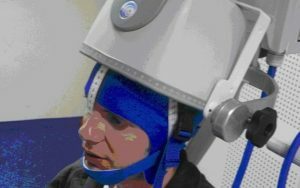 In a filing to the Tel Aviv Stock Exchange on Sunday, Brainsway said that at the moment, Brainsway is the only company to receive FDA approval for a device to treat OCD using the TMS system.